In a region that continues to experience astronomical growth, finding that shiny new thing in the way of a new restaurant or bar is not too tough. Plenty of places come and go—and then there are the spots that stick around through all the ups and downs. Take the Pine Tavern, open since 1936, when Bend was populated by the loggers and mill workers whose livelihoods depended largely on the glorious Ponderosa pine—the second-most common tree in Oregon. The walls of the Pine Tavern are wood-paneled, instantly transporting you back to a time when it wasn’t beer culture and tourism, but forest products that reigned supreme in this area. 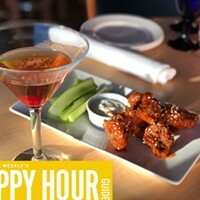 But since this is the happy hour guide, let’s get down to the happy stuff. 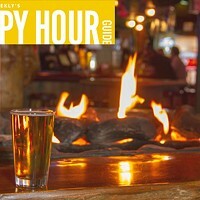 In doing our research for this guide, we conducted a highly scientific poll (Read: we asked a few people what they think) about the places offering the “best” happy hours in Bend. Pine Tavern came up repeatedly, and for good reason. With a slew of yummy food items on offer for $5 or less (including a $4.95 ½ pound burger—yes please!) and a number of drinks on discount, it’s no wonder that the happy hour set comes to this spot in droves. My crew and I snacked to our heart’s content, drank specialty cocktails and still walked away paying about an Andrew Jackson (soon to be replaced by Harriet Tubman?) each. Another big benefit at Pine Tavern: Multiple happy hours. 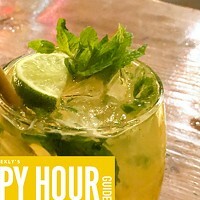 Sure, the Happy Hour Guide you hold in your hand right now is going to help you suss out what’s what, but it doesn’t hurt when a place has multiple happy hours, even in the same day. When you’re downtown and you want a quick bite, a happy hour drink or a taste of the old Bend that is still alive and well, this is your spot.